Dhaka Art Center is delighted to announce the Opening ceremony of a curatorial solo art exhibition titled - ‘Known Unknown’ of artist Farzana Ahmed Urmi, on 6.30 pm, 16 October, Thursday, 2014. The exhibition will continue from 16 to 23 October, 2014. Everyday 3.00 pm to 8.00 pm. 'Farzana Ahmed Urmi' shows an intense interest in questions of perception - in the boundaries and potential of self experience, vision and painting. She has combined conscious vision and the fleeting perception of a blink in one image. Her paintings exhibits fascination with awkwardness and search for an distinct aesthetics from our academic visual arts. Her courage to use elective gestures lends her figures their eerie and powerful presence. Her portraitures are unnerving naked images of agony, anger, soreness, revenge or akin expressive emotions, as she is embracing the known and unknown faces of this urban society. She is striving to create her own artistic identity distinguished with visually penetrating psychological tension and compositional arrangements. While holding a postgraduate degree on Printmaking, Farzana is quite spontaneous to choose any technique as her media. 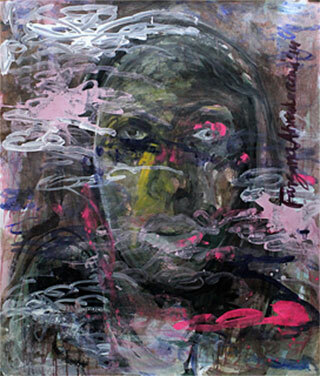 Her surface making with various techniques and materials like paper, ink, watercolor, acrylic, oil, collage and drawn subjects with emotional brush or finger tapping strokes, tremendously shows how intensely she is physically involve with her work. In her work one can see body and psyche are inextricably linked and influenced by each other. Visually her works have a intense quality, as she is oscillating between Figuration and Abstraction. On a fleeting look, her paintings have a figurative quality. But giving a scrutiny, these paintings tend to look flat with dark monochromes, where she indented paring down to an abstraction of line, color, from, tension, mood & atmosphere. She achieves a degree of abstraction as she struggles to watch very closely to know the inner self of a person. This notion of closeness makes her portraits large and abstract to us, as if they have ambiguous hints of facial features. But they have a strong contour and wide-open eyes with lot of psychic expressions. This journey between figuration to abstraction or vice-versa, gives her subject an unsettling impact. And this way her grotesque and nuanced characters raise our everyday to the sublime. Our body, the mirror of the soul and our body speaks its own language. Our body does not forget anything. Our body has its own psyche, which always tries to take the control over us with its own language. We can say, Farzana simply heard that united language of her body and psyche, which came out as a living visual experience of know to unknown.